Bizagi lets use an e-mail server to send notifications defined in Processes. 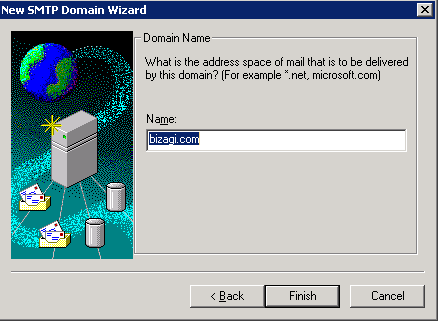 Specify the e-mail server's location in the Environment options of your Bizagi project. However and as a recommended practice, in a production environment you should rely on an intermediate SMTP service running on the local Bizagi server where Automation Server runs. 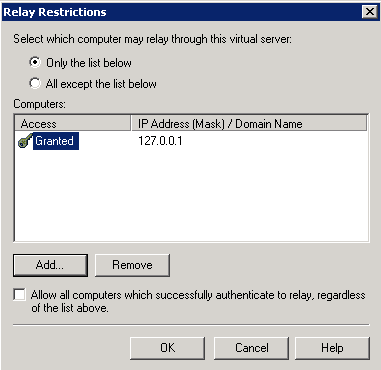 •The need to use authentication to relay to the corporate SMTP server. •You may also use a different SMTP port number than the default one (port 25), or implement TLS. 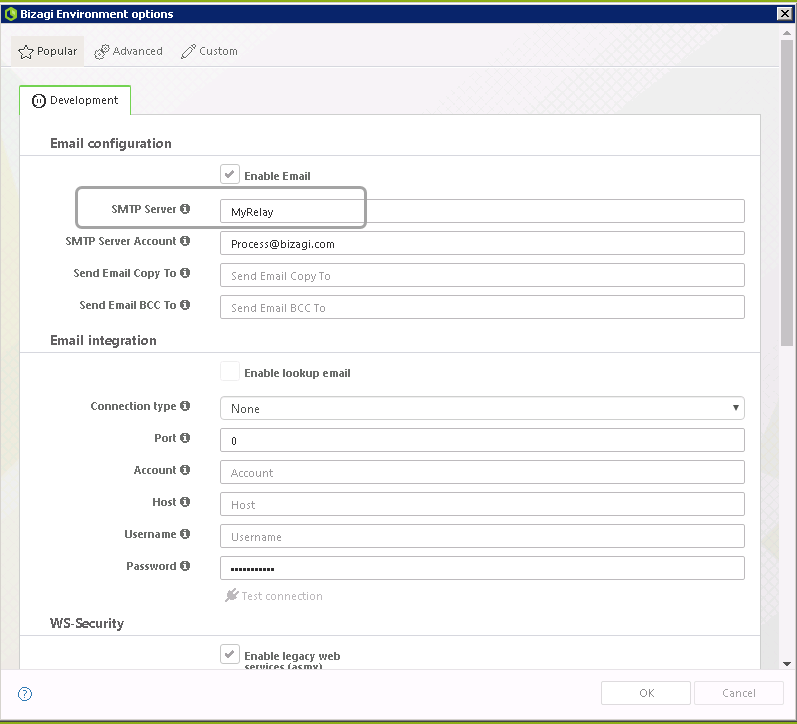 •The possibility of business continuity in your processes (if the SMTP Server is temporarily off-service, processes in Bizagi will continue leaving notifications in queue at the IIS). •Improved traceability and monitoring for process notifications, obtaining additional stats, and the use of a store and forward mechanism. In some scenarios, you may even consider using the intermediate SMTP server on a different server other than the Bizagi server. 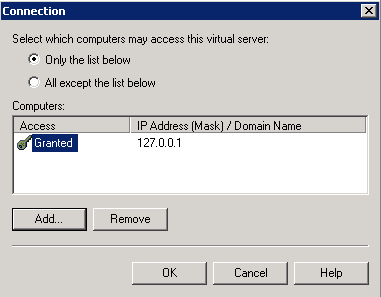 This is not ideal, but is useful when the Bizagi server has no direct access to your corporate SMTP service. 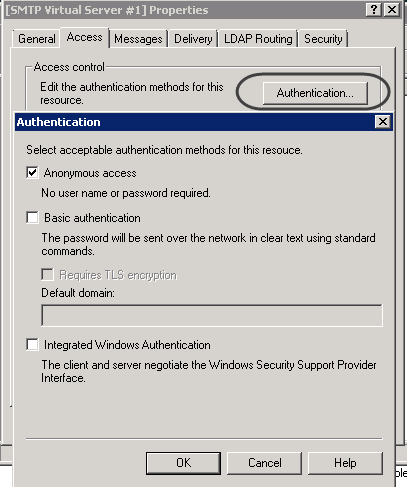 For processes running in Windows operating systems, thee local SMTP service is provided by the IIS which may be enabled directly at the Bizagi server. 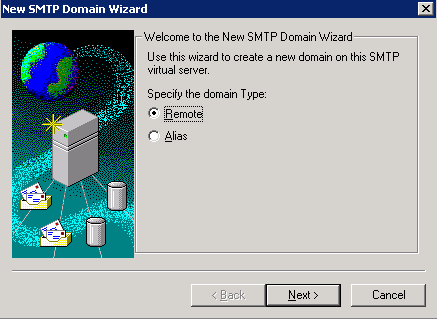 This section shows how to install the SMTP Server service provided by Internet Information Services (IIS), and configure to work with Bizagi by relaying messages to your corporate SMTP (applies when processes are running on a Windows platform). To use and set the SMTP Server service from the IIS, make sure you have the required features and role services installed. 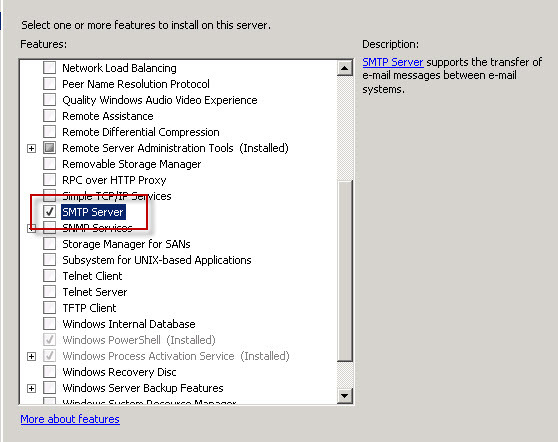 SMTP service is available only for Windows server operating systems (such as Windows Server 2012 and 2008). 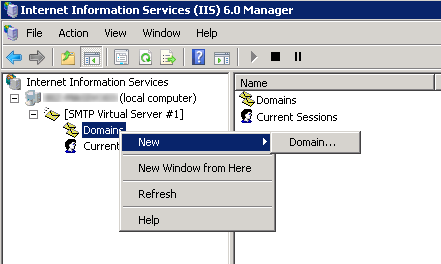 Configure the SMTP service through the IIS 6 Management Console (even when you have a newer version of IIS). 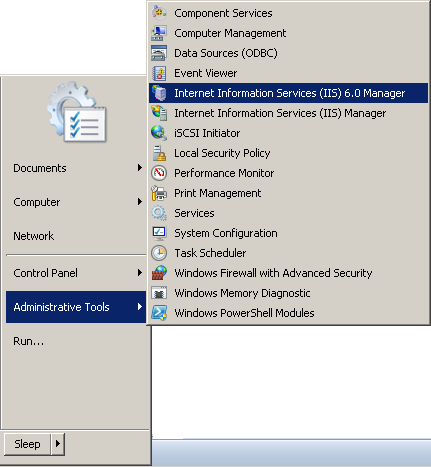 You can use the Start -> Administrative Tools -> Internet Information Services 6.0 option to lanuch it, or use the Server management options. We strongly recommend that you adjust the settings to comply with best security practices. •For the Messages options, tune the parameters to configure: allowed limit message size (according to your permitted and expected increment in file size put by e-mail attachments), allowed limit session size (similar to the previous parameter, but for grouping more than one e-mail in the same activity or Bizagi transaction), limit number of messages per connection to (similar to the previous parameter, but limiting the number of messages when grouping more than one e-mail instead of using file size as criteria), and limit number of recipients per message to (sets the maximum number of recipients in a same e-mail). Review whether your processes in Bizagi send e-mail notifications which may exceed the default settings. •Use the Advanced options to specify the location of your corporate SMTP server (as the smarthost to relay to). To follow best practices, create an SMTP domains to handle notifications from your Bizagi processes. To start, right-click Domains and select New->Domain. Choose Remote as the domain type and click Next. Name this domain to match the domain of your sent notifications, and click Finish. 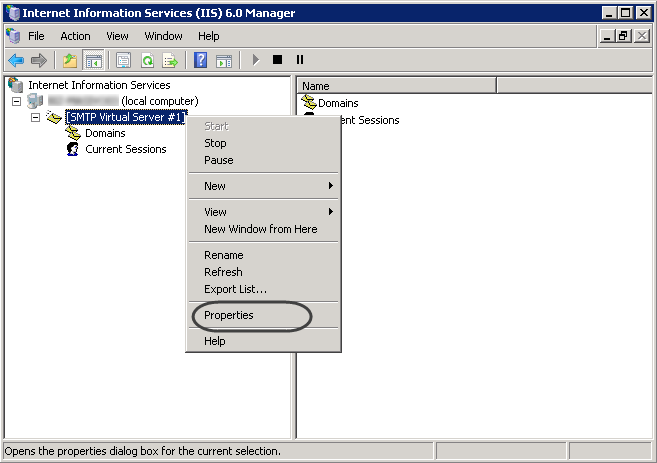 Right-click the newly created domain and select Properties. 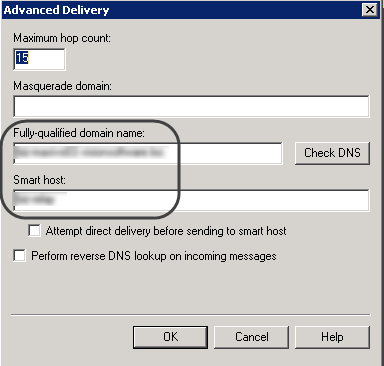 This SMTP server should be the one authorized to send e-mail notifications (make sure that Allow incoming mail to be relayed to this domain is enabled). It needs to support relay. 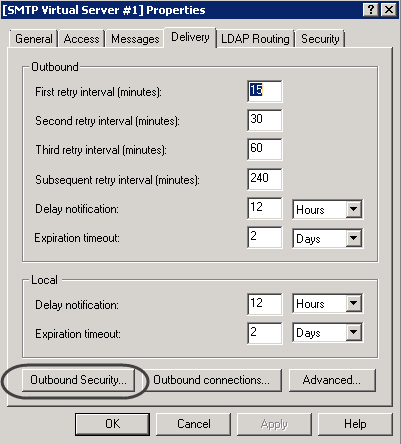 Configure outbound security as needed, according to the credentials you need to provide to your corporate SMTP server. 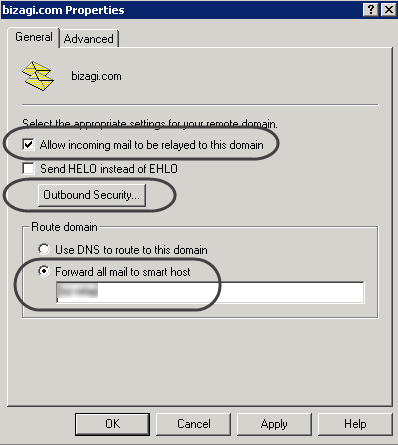 In the Route Domain box of the properties window, select Forward all mail to Smart Host. Enter the name of your corporate SMTP Server, or enter its IP address within square brackets "[ ]". 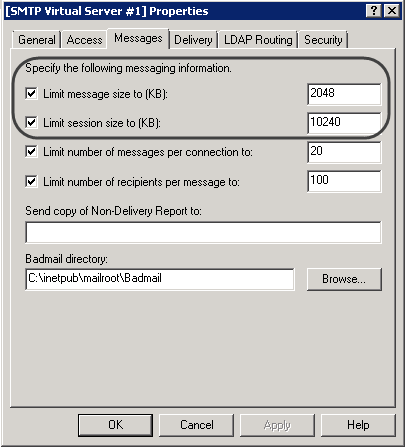 For more information about SMTP domains, refer to Microsoft's official documentation at http://www.microsoft.com/technet/prodtechnol/WindowsServer2003/Library/IIS/e2156172-7118-4ff2-9a6a-1b7dd52580fa.mspx?mfr=true. 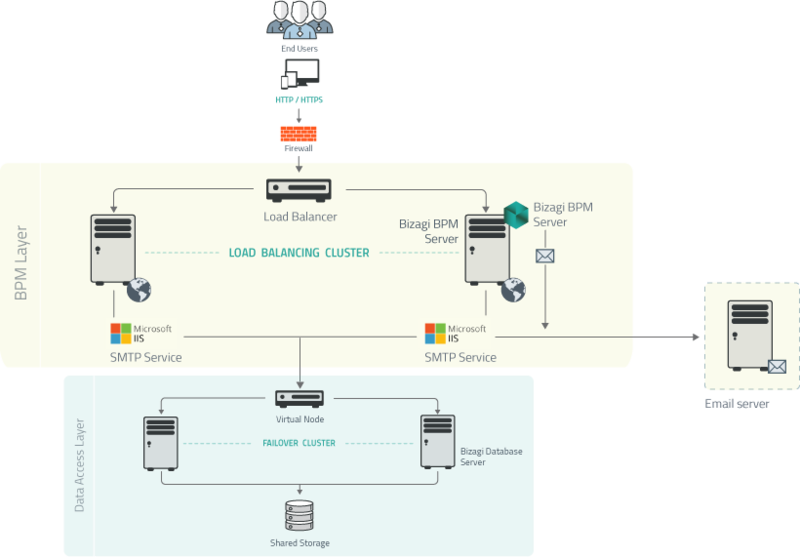 Once the SMTP is setup, configure the environment parameters for your Bizagi project. In the production or testing environments you may do this through the Bizagi Management Console as provided by Automation Server. Reference the local server (localhost) as the SMTP server. For this part, provide information for the Email configuration section. 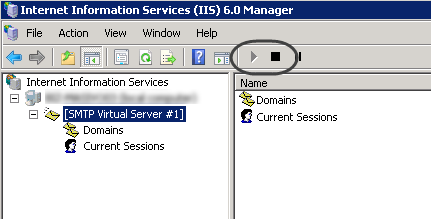 Click OK to save changes and make sure you perform an IISReset on your IIS.